After Joao is fired from his job he shifts into a new dimension. 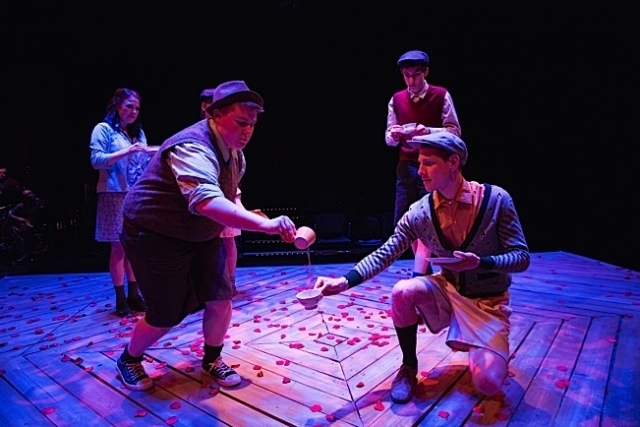 16 nimble actors return us to the magic forest and idyllic village of Joao’s youth where the contrast between his harried dehumanized former life is boldly contrasted with the more human and humane in The Nature Crown at the Guthrie Theater’s Dowling Studio. In the forest people can transform into clouds, trees, and rocks and are chased or chase others who are more metaphorical than actual. The village is ruled by a warmhearted King and Queen and all residents, save one, live in something close to bliss. Theatre Forever’s company collaboration enchants with sweetly vulnerable and imaginatively physical performances all around. A dreamy musicians ensemble and a glorious women’s chamber choir uplift the atmosphere to the level of the ethereal. Jon Ferguson’s direction and Dominic Orlando’s script are infused with a kind of magic. Diogo Lopes endears as Joao. Guthrie’s Dowling Studio, 818 So. 2nd St., Mpls.